I am a mum of two boys, aged 4 and 5. When my children came along I was working in the corporate world in a busy job and like many people I was trying to juggle work and childcare. I wanted to ensure my children had a great foundation from the start and believed that learning through play to support their learning journey was essential to prepare them for school. Encouraging my children on that journey turned out to be harder than I had expected. I spent a lot of money on products because I thought they might help. I bought baskets of flashcards and toys but I didn’t really know if it was helping or how best to support them. It was only when my children started nursery and I spoke to the nursery staff that I understood there that a framework existed , the Early Years Foundation Stage (EYFS), which defines what a child’s learning and development milestones should be and how to help them be school-ready. Over the next few years I researched the EYFS and spoke to many experts about the subject. That led me on an informed search to find the best educational toys that would be fun but would also support the EYFS. Our family tried and tested so many products and my boys had so much fun! I now knew I was supporting my children in the best way I could. They are both now at school doing really well and are very happy. That experience inspired me to set up Gifts for Little Hands in 2015. 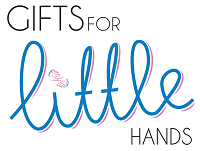 Gifts for Little Hands work with the best Early Years experts and my team are dedicated to helping all parents, carers and teachers find the ideal products for children. We only source the best products from educational suppliers across Europe that meet EU and UK standards. Please do register on our site and also take a look at our Facebook page to keep up to date with all our news and top tips to help you make a child’s learning journeys full of fun! I’d love to hear your stories!